Kleinfeld Bridal Party offers a complete line of dresses for brides, bridesmaids, mothers-of-the-bride, and wedding guests. Featuring today’s top wedding styles and color trends, the collections highlight a carefully curated selection of dresses for virtually any type of wedding. The bridesmaid collection includes exclusive styles by Kleinfeld with dresses under $200. Extra lengths have been added to the dresses which eliminates the need for special orders or extra charges. 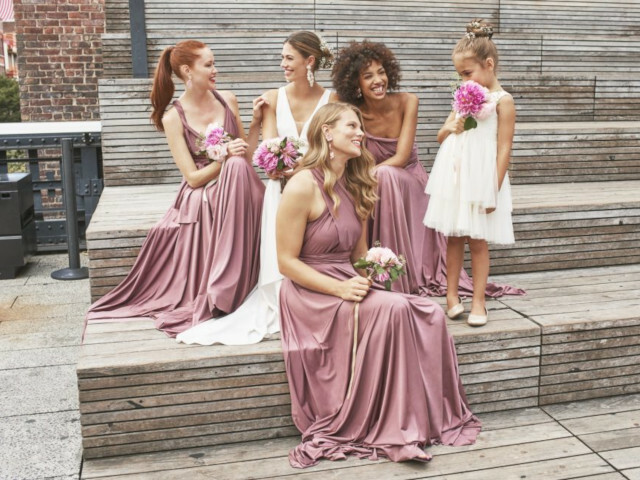 Kleinfeld Bridal Party prides itself on fitting brides and their bridesmaids with in-stock dresses that are ready to ship immediately, thereby creating a stress-free shopping experience. The entire wedding party and guests can now experience the signature quality and timeless style of the Kleinfeld brand delivered right to their doorstep.